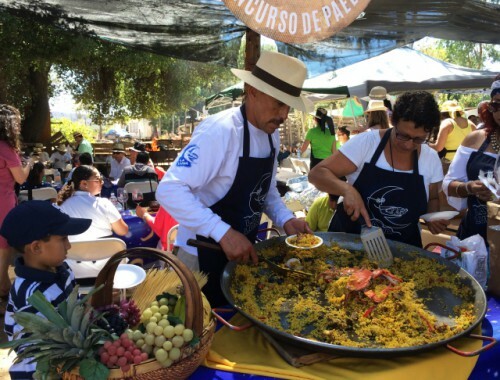 Every year, as the Valle de Guadalupe Fiestas de la Vendimia draw to a close, the Concurso de Paellas (Paella Contest) serves as the grand culmination of the festival. As the last event on the calendar for the annual wine fest, the Paella Contest makes sure that the Vendimia goes out in style. 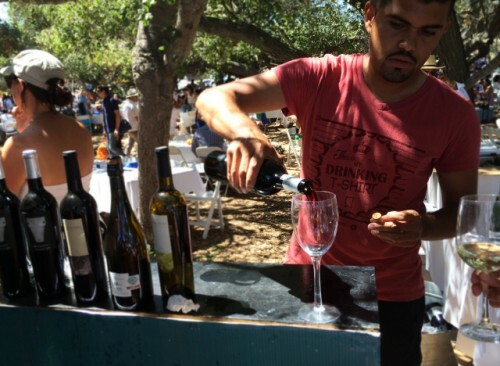 Held at Liceaga winery outside under the oak trees in the dog days of summer, it’s a beautiful and quixotic event. 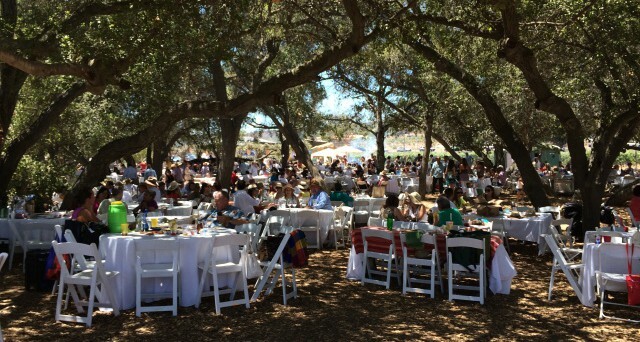 Hundreds of tables are spread out under the shade of the oak trees as thousands of people gather – tipsy on happiness, paella, and wine. The party starts early in the afternoon and goes until the evening with wine, food and live entertainment. Many of the 150 wineries from the region are in attendance, serving tastings of wine to partygoers. And when you need some food to soak up the abundance of wine, you don’t need to go far to find the paella. There are about 90 paella booths set up, all making huge pans of paella, competing for the judges and feeding the hungry masses. There’s no better way to say goodbye to the Vendimia or the last days of summer than by drinking wine and feasting on paella under oak trees in the Valle de Guadalupe. -Arrive early. There are literally thousands of people who attend the event. They all have big groups of family and friends who get there early and reserve tables. If you want to be able to sit down, you should plan on arriving before the event begins to stand in line so that you can get a table when the gates open and the event begins. – Wine tastings are free but if you don’t bring your own wine glass, you’ll need to buy one. Memorabilia wine glasses cost about $7 USD. -You can bring in ice chests with drinks and food. While there’s plenty of paella and wine to go around, you may want to bring other food, beer, waters, etc. There was water and soda available for sale as well as some paletas. -The entire event is outside in the dirt under the trees. Wear appropriate footwear. August is also the hottest month in the Valley with temperatures reaching into triple digits so make sure you’re staying hydrated. While temperatures remain relatively cool under the shade of the trees, you may want to consider bringing a sun hat and make sure you wear clothing to help you stay cool. The 2018 Concurso de Paellas will take place on Sunday, August 19th. Call the Discover Baja office at 800-727-2252 for tickets. Kids are welcome but it’s not an event that’s geared for children. Are there still tickets available for purchase they you??? Is the date set for next year’s paella festival? Hi there, not yet, but we’ll let everyone know as soon as it is. Thanks!